2018 turned out to be a wild ride for investors with equity markets sustaining a 10% correction in the Spring but then going on to make new all-time highs in the major stock market indices towards the end of September 2018. The bears, however, returned in full force in the fourth quarter of 2018 with the major stock market indices losing about 12% to 17% in the Dow, S&P 500 and Nasdaq. The Russell 2000 index lost about 20.5% in the fourth quarter of 2018! The declines in December of approximately 9% for the major stock market indices took most investors especially by surprise since December is historically one of the best performing months for stocks. Fortunately, at Castle Financial we take a more balanced and tactical approach to investing. On a positive note, the All Terrain Opportunity Fund, upon which Castle Financial serves as co-advisor, finished 2018 with a positive return! The fund constitutes a large percentage of most client accounts and has the ability to potentially make money in both up and down markets which resulted in the All Terrain Opportunity Fund finishing in the green for 2018. Visit www.allterrainfunds.com to view disclosures and a prospectus. As a Certified Fund Specialist, and also ranked as a 5 Star Institutional Fund manager by Morningstar, working diligently to help clients navigate the financial markets is my primary goal. In other sectors of the markets, high-grade bonds were the beneficiary of a flight to quality rally into the end of 2018. However, higher interest rates will be a headwind for bonds going forward, and the broad bond market (as represented by the iShares Core U.S. Aggregate Bond Fund) was flat for 2018. Therefore, bonds did not really help investors make money in 2018. On another positive note, the bond funds that Castle Financial owned for clients were all up for 2018, paying approximately 3% to 5% with monthly dividends. The reason for this good performance is that the bond funds that Castle Financial chose are “tactically” managed with shorter durations. Bravo and hats off to these money managers! Before I delve into the numbers, let me acknowledge that stock market corrections and even bear stock markets are inevitable and part of the investment process, but successful investors like Warren Buffet take advantage of downturns in markets to pick-up good stocks at lower prices in order to achieve their outstanding success in building real wealth over time. Let me first begin with some encouraging signs. Mastercard reported that spending during the holiday period (Thanksgiving through Christmas 2018) grew at the fastest pace in six years at more than $850 billion! Underscoring the ongoing shift to online retail, online shopping rose 19.1% compared to 2017. While anecdotal, the U.S. economy is powered by consumer spending, and we do not normally see these types of numbers heading into a major slowdown. We also just got some more great jobs numbers in the last report with more people working in our country than in history! However, we must remember that the markets are forward-looking and stocks react more on future expectations. Now hold your nose and read on for my thoughts on the markets for the next year or perhaps shorter or longer periods depending upon how things play out going forward. I think the 2019 outlook will continue to be dominated by some of the same key themes of 2018 with the China trade negotiations, Brexit, the European Union problems, a growing concern of a global economic slowdown, the political sabotage by the Republican and Democratic parties of each other and future Fed policy. With regard to the “FED” (after a complete failure on the part of the Fed Chair at his December 19, 2018 press conference) our beloved Fed Chair, Jerome Powel, increased the Fed Funds rate and also sent a confusing message for future Fed policy, which sent stocks into a nose-dive. However, Powell righted the ship by delivering a new message on Friday, January 4, 2019 that calmed the markets by stating the Fed will be more data dependent and can pivot on the balance sheet issues if warranted and not automatically raise the Fed funds rate in the future. Many other issues are major hurdles like starting up the U.S. government, negotiating a trade deal with China, solving Brexit or turning around the slowing global economy along with other detractors. In addition, there are growing concerns about a potential recession on the horizon in the USA. If not a recession, then growth potentially slowing to the 1% to 2% range for GDP. Also, many are questioning company earnings forecasts, so the overvaluation theme for equities is back on the table. The poor earnings guidance from Apple certainly validated these concerns sending stocks sharply lower, and we will get a better picture of corporate earnings and forward guidance in the middle of January 2019. Global economic growth is slowing, the Eurozone political situation rivals the issues here in the Washington, D.C. political circus, and some experts are calling for a hard economic landing for China. Crude oil prices have dropped rapidly reminding investors of what took place in the stock market in late 2015 into early 2016 with a global growth scare back then that put the long-term uptrend in jeopardy. But the equity markets righted themselves, and new highs were achieved for the major stock market indices! That does not mean that I see new highs ahead in the intermediate future, but infers that the trend has a decent chance of stabilizing, instead of falling into full-fledged Bear stock market. At this junction, nobody knows for certain if the bull stock market can be re-established and extends or not. However, I do know that it is impossible to outthink the stock market! In my view, it is far better to make some adjustments to ride out the volatility while we wait for a firmly established trend to tell us what direction the equity markets will take going forward. Stay tuned. 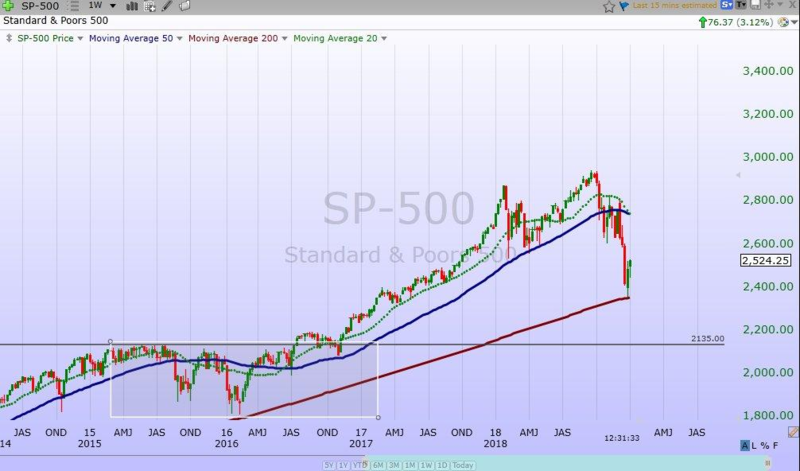 . .
For the first time in many years, we enter 2019 with a questionable long-term trend for stocks, and there are growing concerns of a brutal Bear stock market on the horizon with the major stock market indices continuing lower from the stock market free-fall during the fourth quarter of 2018. I do not believe that anyone truly has any conviction of how the new year is going to play out. Hence my hesitation to put forth a prognostication for 2019, but I am hopeful that this may turn out to be the year of resolutions to many issues plaguing the markets that I have cited earlier in this update. It appears that the equity markets are trying to form some sort of bottom at the 200-week moving average that can be relied on to hold stock prices from declining further. I think what we all need to simply remember is that with each stock trade there is a buyer and a seller and shares move into stronger hands with each transaction as the buyer believes that share prices will be higher in the future. However, we are likely in the early stages of this process, and any bottoming process is a very difficult situation to predict. On that thought, I believe that hitching your investment wagon to a wildly bearish view or a wildly bullish outlook could be a huge mistake as we enter 2019. Accordingly, we will continue to monitor the markets very closely and adjust accordingly to protect and grow client assets to achieve their longer-term financial goals. On the corporate profits front, after growing north of 20% for 2018, earning will probably slow, but I think that an earnings recession seems nearly as unlikely as a conventional economic recession. FactSet estimates earnings will grow 8 percent for all of 2019, a substantial decline from the recent past earning growth rates, but still moving higher. In addition, consumer and business sentiment has edged lower but is still holding near historical norms. Echoing the White House position, as expressed through Treasury Secretary Steven Mnuchin, I blame programmed trading and "technical factors" rather than a deterioration in economic and corporate fundamentals as the reason for the fourth-quarter stock market panic selling. I think we should end computer algorithms program trading which exaggerates the moves in markets and only serves to line corrupt government officials’ pockets that are likely being paid-off under the table to allow this unwarranted disruption of financial markets and global economies. They tell us that the algorithm computer program trading systems provide added liquidity to the markets, but that is simply a lot of nonsense in my humble opinion, and I am glad that Treasury Secretary Steven Mnuchin is acknowledging this growing nemesis to orderly markets. Now more than ever, we need stability in the markets and not computer programs that now account for about 85% of trading with some algorithm trading systems that drive markets higher or lower in order to skim profits off these greatly exaggerated swings and manipulated market moves. End it now because greed, corruption, inept government officials, explosive debt and debasement of currency ended the Roman Empire, and the USA is headed down the same path. Let’s all hope and pray that we all can move forward and unite in the new year for the good of our nation! My very best wishes to all our valued clients for a safe, healthy and prosperous new year! 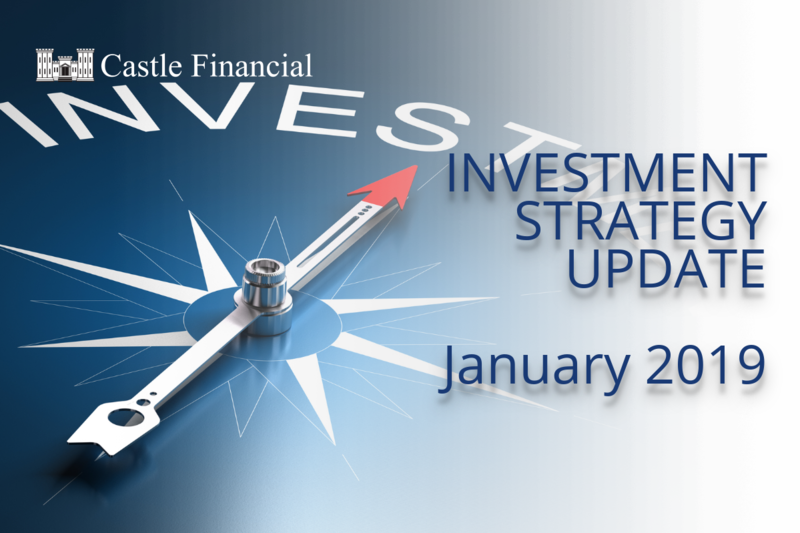 If you are reading this update and are not a valued client of Castle Financial, call us for a free consultation and second opinion on your financial plans, goals, and investments. Need Help with Financial Planning and Navigating the Road to Retirement? Schedule your complimentary and valuable consultation with a member of the Castle Financial team. Email or call us today at (732) 888-4994. You can also take advantage of the many valuable updates and videos in our Resource Center and on the Castle Financial blog. Information contained herein is obtained from industry sources believed to be reliable. The information presented comes from different sources on a weekly basis and is intended to provide a commentary related to market events and is not intended to be used as investment advice or represent any specific product or service. Market information and performance information is provided from different industry sources including, but not limited to TD Ameritrade; MMG; Barron’s; BBC; NPR; Reuters; MFS Research; CNBC; CME; The Wall Street Journal Online; Bloomberg News; Financial Times; Forbes; CNNMoney; J.D. Power Valuation Services; The Economic Times; USA Today; stockcharts; CotSignals; Bespoke; Manheim; FreeStockCharts; The Fed; LPL Research; FactSet; Econoday; U.S Bureau of Economic Analysis; Hulbert Ratings; World Development Indicators database from the World Bank and the Internet.